The Phönix J 1 plans from MJD Models is published as a construction article series in the Swedish hobby magazine “Allt om Hobby”. This is a small sized scale model with “big” performance. 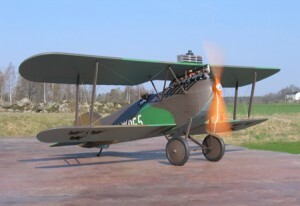 The Phönix J 1 is a slow flying biplane with a lot of charm. Its large wing area makes it an interesting model with superb handling qualities. It has ideal proportions for a flying scale model. The two big drawing sheets is designed using CAD-technology. It is a traditional design using balsa and plywood, which makes it both easy to build and easy to repair if an accident should occur. This model is recommended to the average builder/pilot with experience from a couple of models before. The Phönix J 1 has a scale contour and can be built to a very accurate model of the full size. The Phönix J 1 was the first fighter in the Swedish Air Force. The original Phönix was an Austrian design but they were also built under license in Sweden. The aircraft did service in Sweden between 1920-1933. The DIII version used in Sweden was powered by strong BMW or Hiero engines, giving the Phönix sparkling performance. The only preserved Phönix today is located at the Flygvapenmuseum in Linköping.